Termite soldiers are able to chemically detect intruders in their colonies. While most trespassers are swiftly dealt with, some spiders, centipedes, millipedes, and insects are allowed to find shelter within termite nests. These arthropods are known as "termitophiles." 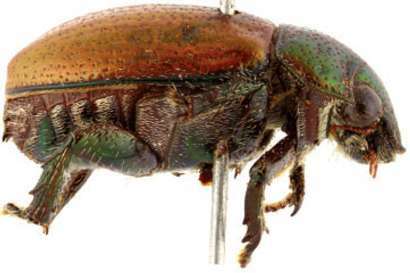 Now for the first time ever, an international team of scientists has provided a record of chafer leaf beetles (Leucothyreus suturalis) living in the nests of two different termite species—Cornitermes cumulans and Silvestritermes holmgreni—in Brazil. Their observations are published in the journal Annals of the Entomological Society of America. 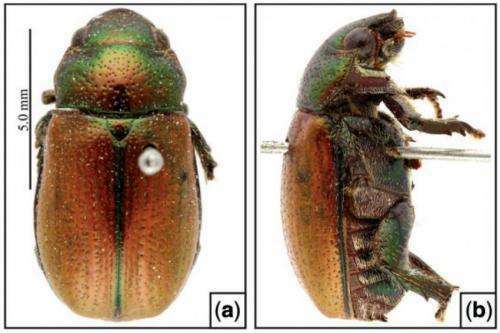 "Third-instar larvae of Leucothyreus suturalis Castelnau (Coleoptera: Scarabaeidae: Rutelinae) were found embedded in peripheral areas of the nests of C. cumulans and S. holmgreni located in pasturelands or in forest edges of the Brazilian Atlantic Forest," they wrote. "Additionally, we provide information on the life cycle of this beetle species." More than 4,000 scarab beetles in the subfamily Rutelinae have been described, but only seven have been previously documented to be associated with social insects—namely, honey bees, leafcutter ants, and harvester ants. This is the first time that a member of this subfamily has been documented among termites. According to the authors, the scarab beetle larvae are probably able to remain undetected because they dwell in parts of the termite nest that are not inspected often. "We think that the location of the larvae of L. suturalis within the periphery of the host nest is a strategy that maximizes survival and also minimizes costs to the host colony," they wrote. "Larvae were not integrated into the host galleries, and soldiers were not apparently patrolling this portion of the nest." They also believe that L. suturalis larvae feed on something within the termite nest, unlike other beetles in the genus Leucothyreus, which are known to feed on roots. "Feeding on roots within the termite nest would require larvae to migrate toward the root resource, thus exposing them to patrolling termite soldiers," they wrote. "Therefore, we think it is most plausible that larvae of L. suturalis feed on the nest structure itself rather than roots within the exterior wall of the nest."